With time given to reflect, today starts the series of articles where our match reporters give their views on last season and start planning for the next, Colin Murrant was the first to file his thoughts. 'I do not see the promoted clubs being a threat and there were several teams above us in the Final table that I would expect us to finish above: therefore I go for 8th.' One position out, but in light of our position around Christmas, should have been at least 7th. 'I hope we take the FA Cup seriously and believe that any club that does can progress to the latter stages depending on the draw; a home tie would be nice for a change. So final of one of the cups would be my target with an expectation to reach the semi-finals.' One round out again although, but for suspect team selection against Man City in the Carabao Cup, and appalling goalkeeping error against Chelsea in the FA Cup, who knows what might have been? Six, overall this might have been a good season pre 15/16, but expectations have changed. Last season end I said I could not see Shakespeare as a manager so I expected we would waste a period of the season until he was sacked. Puel's impact was immense initially, Southampton away was a very special performance. Then team selections became random with no consistency, playing the 'well past his sell by date' Morgan ahead of Dragovic was bizarre; perhaps the only time I have heard fans 100% in unison about a player. The home form at the end was disgraceful, Arsenal apart. The Carabao Cup was a real opportunity against a strong but weakened Man City side: Vardy and Mahrez on the bench ended up playing most of the second-half and extra time, so why not start with them. All in all, very disappointing since January. Harry played every minute of the Premier League matches and fully deserved his award. He is not the finished article yet and I feel he would have learned so much more by playing with Huth rather than Morgan. However, it was so refreshing to see a City Centre Back comfortable on the ball, at £17m in today’s market, a snip! Only other City players would be Vardy and Ndidi. Vardy because the quality of some of his goals was outstanding and he fed on scraps towards the back end of the season yet still scored 20 goals in the PL. An analysis in the Daily Mail shows him converting over 77% of his 'big chances', Kane is 5th in the analysis on 56%. ; and second only to Rooney in the overall chance conversion rate. Ndidi, loved this guy since beating Lukaku in the air in the first minute of his debut in January 2017. Still raw at times but what energy he has and wins so much possession for City. What were your views on the signings made during last season? Silva is a slight positive, I think he will/can be a real asset but just when I think he is getting there he seems to disappoint, I think next season Puel needs to make a decision on what his midfield is, I hope Silva is a part of it. Diabate, so refreshing yet so left footed. Great debut at Peterborough and has showed glimpses of his pace and skill in the PL. Perhaps ahead of schedule as he was expected to go into the Development Squad. One definitely for the future and ahead of Gray in my opinion. Iheanacho, looks like he is getting back to his best form as seen when at Man City. Getting anyone to play with Vardy has been a problem, Okazaki has done it best of all but doesn't score enough goals. Iheanacho's cameo at WBA away was superb, stick my neck out and say he will have a great season in 2018/19, especially as he is upping his work rate. Dragovic, wonderful when he plays, no idea why he has not played more especially as you think he was a Puel type player: comfortable on the ball and can bring it out of defence – Please sign him up! Jakupovic, not really had a chance but looked comfortable in the matches against Fleetwood. In the Premier League was good against Arsenal and only on Spurs' first goal did I think he could have done better on his near post. Iborra, I rate this guy, so important in both boxes and midfield with his heading ability. A little inconsistent in his performances but next season should be a good one for him. Which player do you think made the most progress last season and why? It would be Wilfred Ndidi, at his tender age the team is much weaker without him. Improve his passing accuracy and his shooting and he will be top class. Which player did you think underperformed the most last season and why? If I am allowed to pick three – Schmeichel, Morgan, Chilwell … oh and Gray (four). Kasper so hesitant coming off his line, Morgan so slow (both missed Huth immensely), Chilwell not a full back, Gray an enigma. 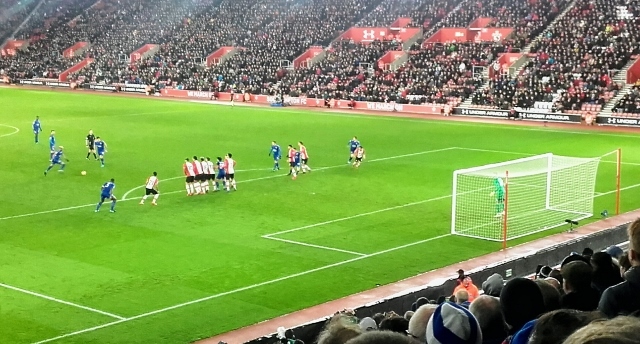 The Southampton away performance, wonderful football, wonderful goals, wonderful night. I really thought we would go on to qualify for Europe after that performance. I would not trust him to spend my money but, as I write, the owners' have just sanctioned £20m on Ricardo Pereira so it looks like they are backing him. I do not like his lack of charisma and his poor communication skill but, more than anything, I think his team selection, particularly Dragovic omission, is difficult to understand. New Goal keeper, new full backs, new centre half, creative mid fielder. Higher tempo performances as seen against Arsenal. Probably a change in formation to 3-5-2 with Dragovic-Evans (?) – Maguire. No problems with Chilwell as a midfielder in this formation if he improves his crossing. I think this season without Huth has shown what an immense impact he had on City’s great escape and title, we missed him sorely. Not sure as I haven't followed their progress that closely. Elder at Wigan had a good season but not sure on his ability to step up at left-back in the PL at this moment in time. Musa has done well at CSKA but I think his best position is where Vardy plays. Kapustka, Mendy, Slimani, Ulloa and King, I think they may have played their last game for the Club. Moore and Sowah at OH Leuven, no views on them. I think Hughes, Thomas and Barnes from the development squad may make breakthroughs. Either Pope or Heaton at Burnley, cannot see them wanting to both stay as they are top keepers: so impressed with Pope at Burnley when we played them, commanded his 6-yard box. Kasper has had a poor season, he appears to be even more reluctant to come off the line, also his positioning at free kicks just outside the box is questionable. With Maguire, Evans (seeming likely), Dragovic (hopefully) and Pereira we will have a stronger defence. A top-class goalkeeper will add to our strength at the back which has been sadly lacking this last season. Puel does not inspire confidence. At Southampton in 16/17 he finished eighth and, but for a dubious decision, should have won the League Cup. He lost Wanyama, Mane, Pelle before the season started and Van Dijk was injured for a fair portion of the season, so no mean feat even though it tailed off towards the season end. This season again he did very well but then the season petered out badly. Given the owners appear to be sticking with him, I really hope he can kick on for a whole season; also, I am a little fed up with the constant management changes and hope we can get some stability.